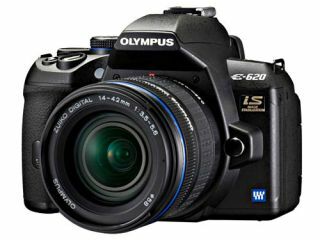 Olympus has announced the newest addition to its burgeoning DSLR range – the 12.3MP E-620. Billed as 'the world's smallest DSLR with in-body image stabilisation', the E-620 is as compact a DSLR camera you can get – measuring just 130x94x60mm. Because of this it weighs a mere 475g (body only). Ease of use is very much the order of the day for this camera. Aimed at hobbyists looking for a nice mixture of manual controls and pre-created niceties, the camera comes equipped with a varied selection of Art Filters and Multiple Exposures. While professionals may reel in horror at the thought of 'arty' filters, Olympus is hoping that Pop Art, Grainy Black & White, and Pin Hole will entice newcomers to the world of DSLRs. And it they are good enough for the E-30, then they're good enough for the company's latest cam. The camera's 2.7-inch Live View HyperCrystal III LCD is swivel screen, which means that you can angle your camera like never before and still retain an eye on the image. Autofocus is limited to 7-points – accurate, but not the best out there, and the usual Face Detection gubbins is also included. The E-620 will be available in the UK with an ED 14-42mm f/3.5-5.6 Zuiko zoom bundled in. UK pricing is still TBA, but it's priced at $799.99 (£550) in the US.